The Asian-inspired sauce in this dish is a perfect complement to the earthy sunchokes. Fill a medium bowl with water and ice. Cut the lemon in half and squeeze the lemon juice into the bowl, then place the two halves into the bowl. Set aside. Scrub the sunchokes with a vegetable brush until clean. Slice the sunchokes or if they are golf-ball sized, cut them in half. Put them in the ice water as you work. In a large bowl, whisk together the olive oil, rice wine vinegar, soy sauce, honey, salt and pepper. Drain the sunchokes, dry them with a towel and add them to the olive oil mixture. Toss to coat completely and pour onto a baking sheet. Roast for 35-45 minutes, until tender. Meanwhile, in a dry sauté pan, toast the sesame seeds on low heat until lightly browned, about 1 minute. 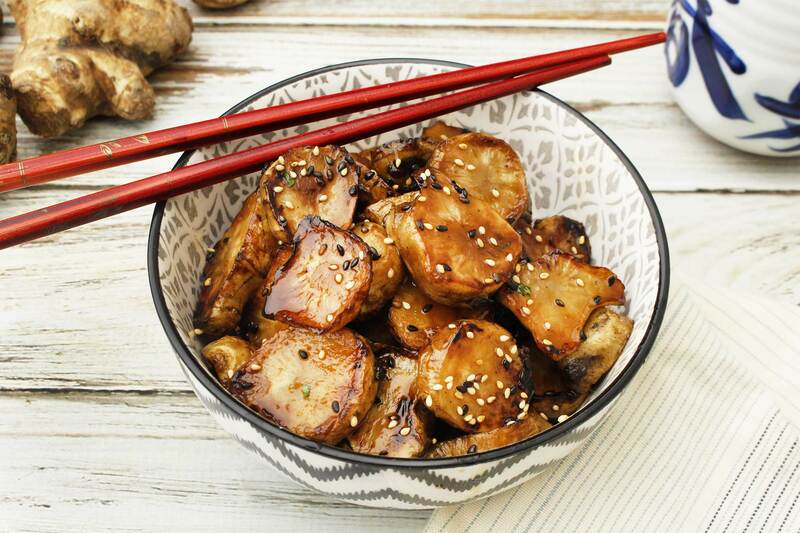 When the sunchokes are finished, sprinkle the toasted sesame seeds over the top and serve.